Nokia didn't have a booth, but they did have a truck and some colorful chairs. 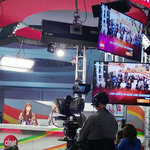 The Verge was there! Although I couldn't go inside. 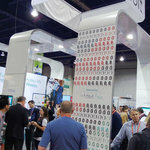 Parrot was showing off their flying AR Drones. 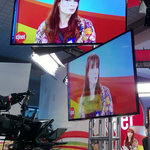 Felicia Day was there on CNet! 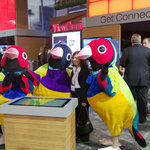 The ViewSonic parrots were there. Paras (a fellow ambassador) in a racecar! 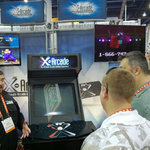 X-Arcade, which makes cool multicade systems. DTS had people dancing inside a tiny house. It was weird. On the way back to the hotel, I went through Harrah's and walked by this kind of bizarre statue thing. I also walked by Caesar's Palace and the Forum Shops.